Fitting into a new workplace is never easy but it’s made all the more easy if the environment is inclusive and welcoming, the people happy to get to know you and share their expertise with you, and you can be yourself. Unfortunately for many people, especially people such as woman, minorities and LGBTQI people who don’t fit into the prevailing white masculine culture of many Western workplaces, being yourself isn’t always an option. 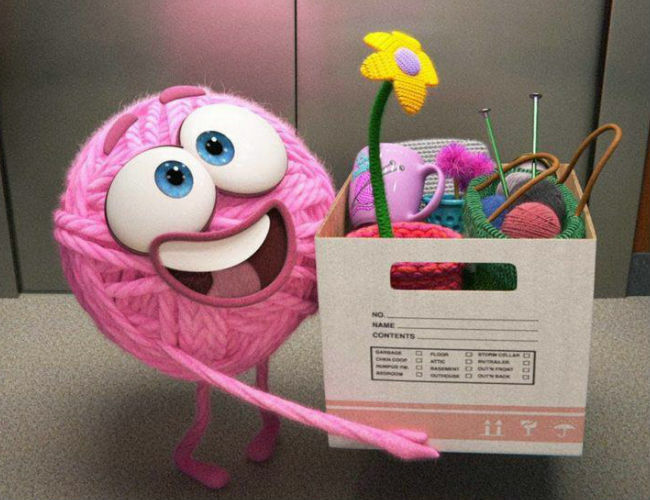 It’s a tough and complex issue and one that Purl, part of Pixar’s new SparksShorts initiative, aimed says EW, with “cultivating independent projects from the company’s own artists and directors”, tackles with an impressive level of maturity and insight and also the studio’s trademark wit and whimsy. Watching Purl arrive at B.R.O. Capital, which is all men in dark suits talking about aggressive corporate ploys and chicken wing specials at the local bar, you’re stuck by her enthusiasm and individuality, and then by how much she has to give up to fit in, a dynamic that Kristen Lester and Gillian Libbert-Duncan are all too familiar with. Purl examines this very contemporary issue in a way that will move you but also get you thinking, which is important if meaningful change is ever to be affected and workplaces changed in the wonderfully inclusive way that Purl envisions.